An antique line engraving drawn and engraved by H. Bibby. From England's Battles by Sea and Land by Lieut Col Williams. Published by The London Printing and Publishing Company. Circa 1860 with later hand colouring. An antique line engraving drawn and engraved by H. Bibby. From England's Battles by Sea and Land by Lieut Col Williams. Published by The London Printing and Publishing Company. 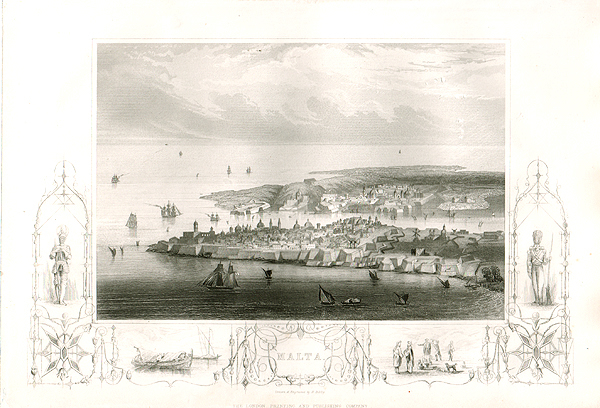 Circa 1860. Malta : Valetta from the Quarantine Harbour. An antique woodcut engraving with related text beneath, which was published in "The Illustrated London News" on March 18th, 1854. It has bee coloured by hand. A "Go Cart" picnic in Malta. Antique woodcut engravings which were published in "The Graphic" on November 27th, 1886. The Return of the Mediterranean Fleet from Suda Bay - Sketches in Malta. Antique woodcut engravings which were published in "The Graphic" on August 28th, 1886.
Review at Malta of Troops en route for China. An antique woodcut engraving which was published in "The Illustrated London News". "The Orinoco" landing troops at Malta. A woodcut engraving which was published in "The Illustrated London News" on 25th March, 1854. Trinity Church and Parsonage, Sliema, Malta. An antique woodcut engraving which appeared in "The Illustrated London News" on Jan 30th, 1869. Landing of Lieutenant - General Sir Patrick Grant, the new Governor of Malta. An antique woodcut engraving which was published in "The Illustrated London News" on June 15th, 1867. 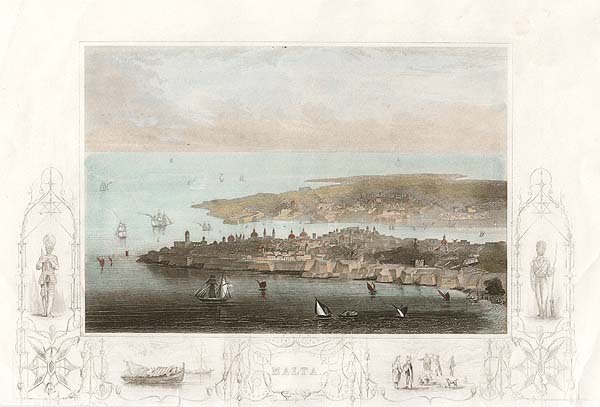 The arrival of the "Ophir" at Malta. 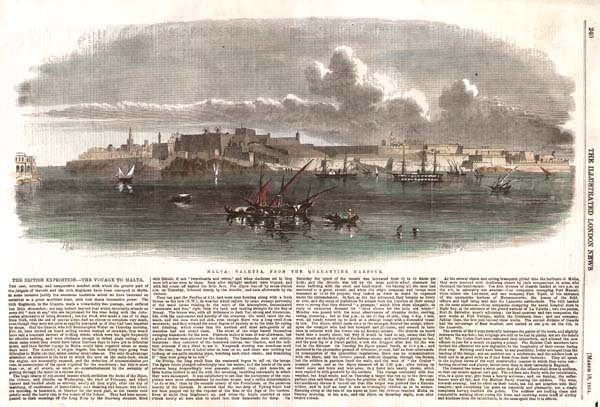 An antique woodcut engraving entitled "The Arrival of the "Ophir" at Malta : The Scene from the forebridge of H.M.S. Caesar in Valetta Harbour, March, 25" . This appeared in "The Illustrated London News" on April 6th, 1901. The colouring is later.